For all of you that just can’t get enough of Black Raven Brewing’s beer, here is a new release that you will likely want to seek out. It is as good a reason as any to stop by and check out their expanded tap room as well. 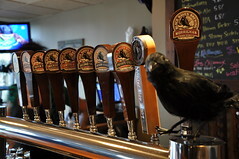 Brewed in the Russian Imperial Stout style, our newest release is the first Imperial stout brewed by Black Raven. Based on the results, we will be brewing this again and again over the years! Sorry, no kegs to go or growlers of this one. You can stop on by tomorrow to try the stout and then stay for their cask night, when they will be serving a cask of “Peppered IPA”, which is their Trickster IPA with various exotic peppercorns, grains of paradise, beet powder and Cz Saaz hops. Starts at 4pm.